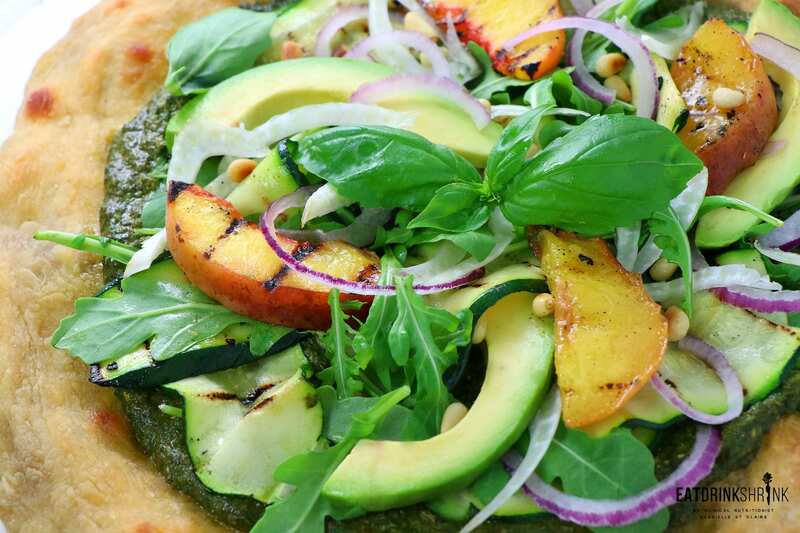 Vegan Grilled Peach Pesto Pizza - Eat. Drink. Shrink. If there is one thing I love about summer, it’s the food! I find it typically lighter, brighter, and easily more packed with fruits and veggies. As a Georgia native, one of my fave summer fruits is peaches. Surprisingly its not to make desserts, but more so to throw them into savory dishes. 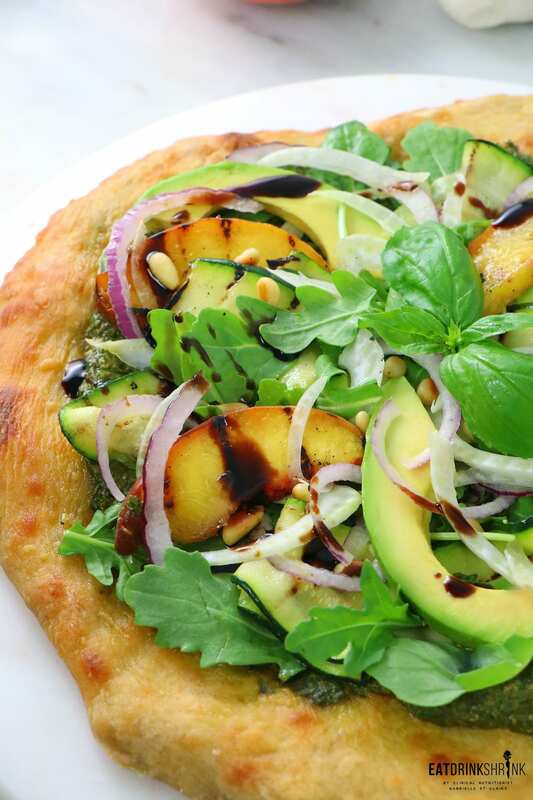 Whether it’s a salad or bbq sauce or this particular pizza, I love how they add a hint of sweetness to recipes and break up the savory. 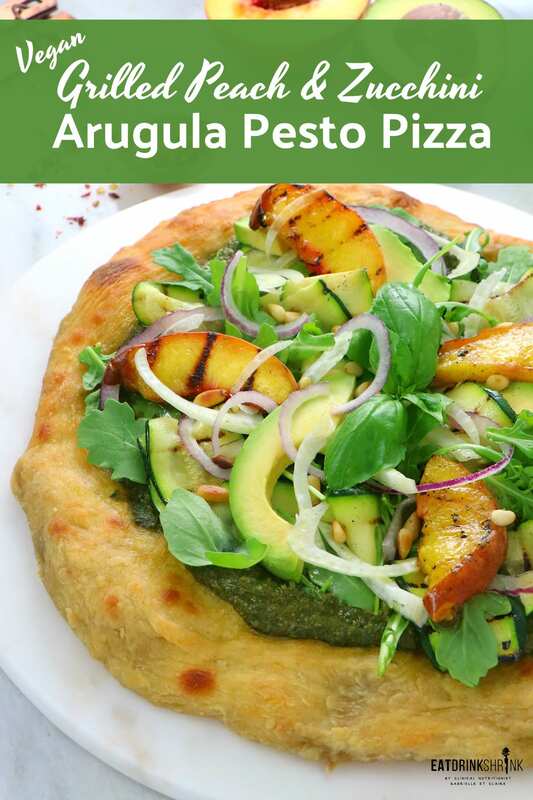 This recipe was one of the first pizza’s I ever did, and remains to be one of my personal favorites! What I love about this recipe is just everything! 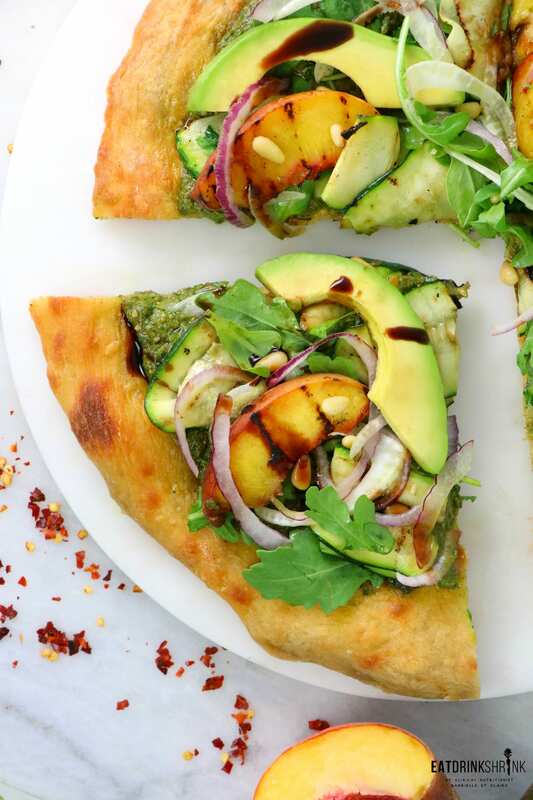 It’s straightforward, no nonsense, packs tons of fruit, veggies, healthy fats, texture, flavor, gorgeous presentation, the flavors blend seamlessly together, and truly captures the essence of summer pizza! 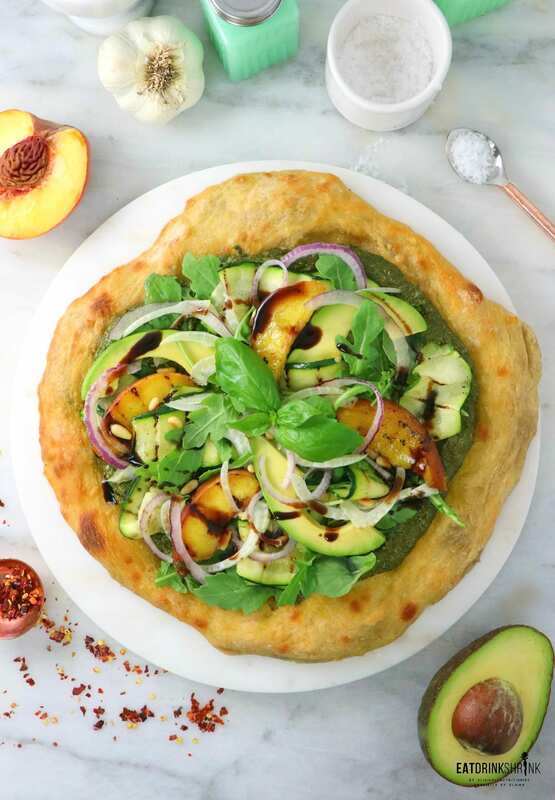 If you’re looking for that perf summer inspired pizza as the season comes to a close, you have to try may recipe for Grilled Peach Pesto Pizza! 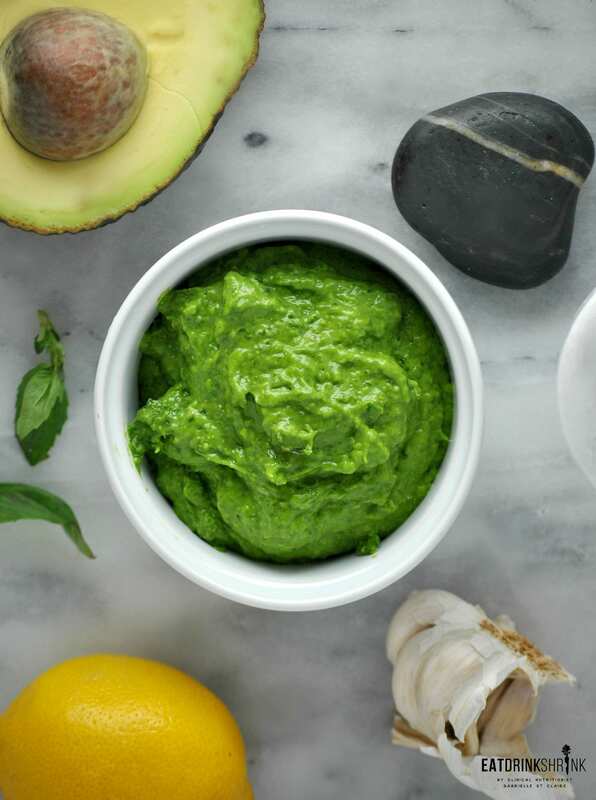 Pesto: Blend all the ingredients in a food processor until smooth. Taste and adjust, set aside. Pizza: Preheat the oven to 450. 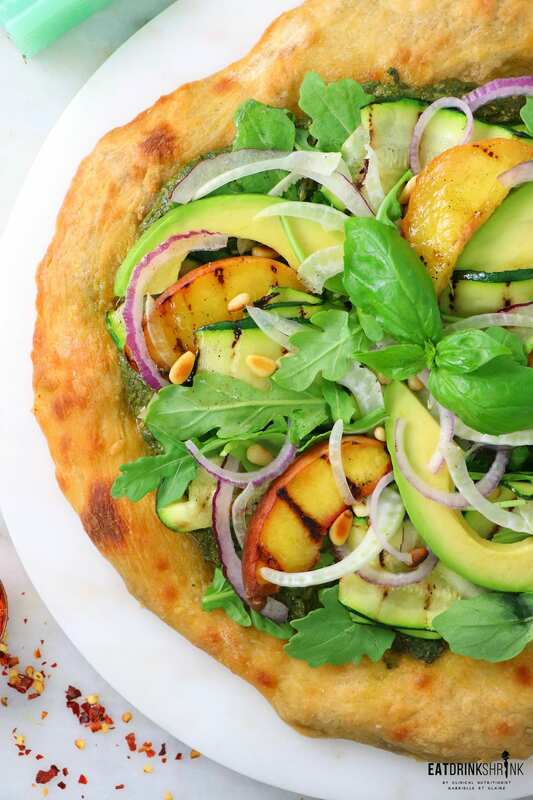 Roll out the pizza dough to a 12" thin circle. Transfer to a pizza pan (I like the ones with holes on the bottom, gives a crispier crust). Coat the edges with olive oil and optional vegan parmesan. Bake the crust for 15 minutes or until golden brown. 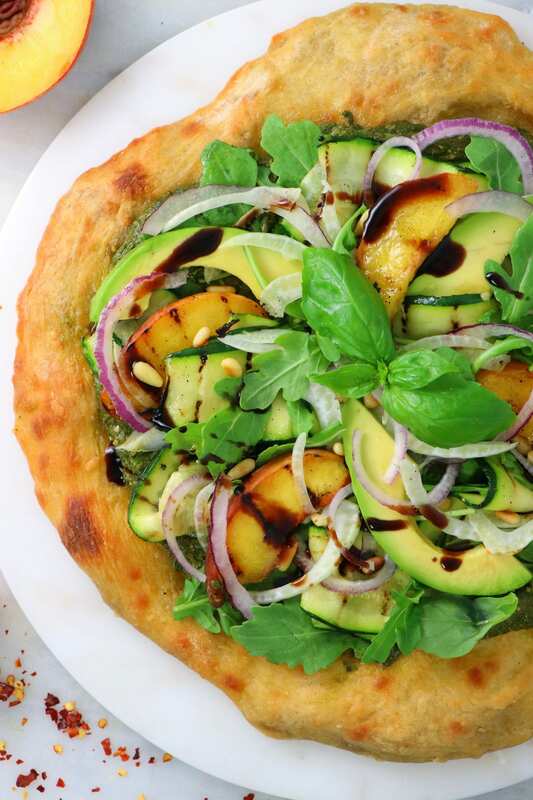 Remove, spread the pesto generously all over the pizza, add the grilled zucchini, grilled peaches, red onion, arugula, avocado, fennel and top with a drizzle of olive oil, balsamic glaze, additional vegan parm, toasted pine nuts and basil. Enjoy! 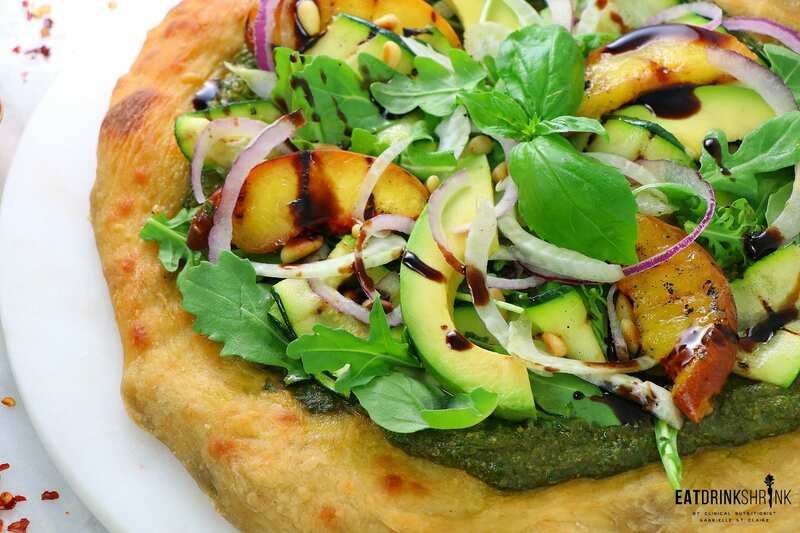 Coat with a little olive oil and grill zucchini (can top w/ salt/pepper) and peaches - If you don't own a balsamic glaze you can make one: add 1/2 cup balsamic vinegar with 1/2 tbsp of sugar to a small pan over medium heat, stir to dissolve the sugar, cook for 5 minutes until it thickens.